Story: Blackjak originally tried out as a Youngblood, but didn't make it thru basic training, as he didn't have the right attitude for the job . 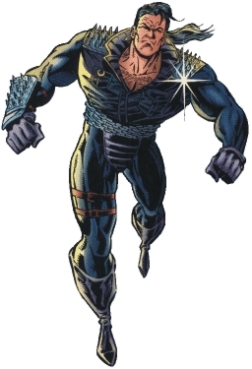 When the crime czar Vendetta created her team of mercenaries The Regulators, Blackjak was hired to lead the team . Blackjak led the team both under Vendetta's control and later when the team left her , which is where he was last seen . Skills & abilities: Super strength, flight, and super-dense skin making him invulnerable. Blackjak is approximately three times as fast as an Olympic-level athlete.